Hause’s new stuff was highly conducive to the it-hits-you factor, the experience a listener has when a song is so instantly catchy that it’s stuck in your head by the first chorus. 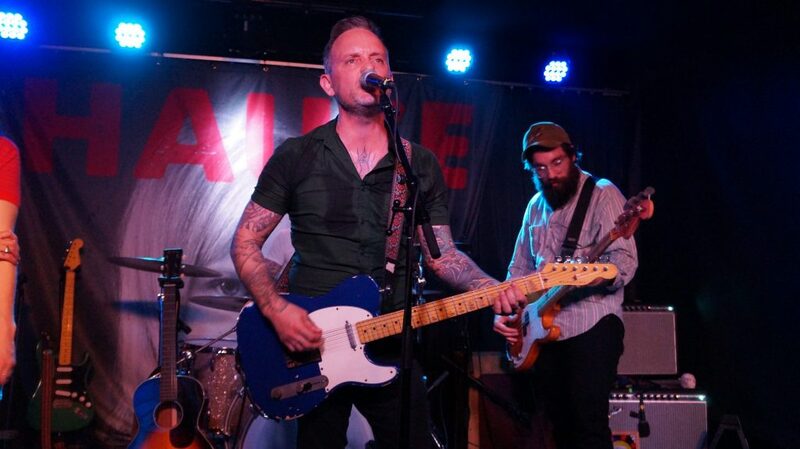 The unmistakably Philly punk stalwart Dave Hause, whose last album was appropriately titled Bury Me in Philly, made his way to Boot and Saddle Wednesday night with his band The Mermaid for the first of two sold-out performances at the South Philly venue. Hause gave fans a sneak preview of several new songs off his upcoming album, Kick, scheduled to be released this Friday. Among them were the show’s opener, “Eye Aye I,” “Saboteurs” and “Civil Lies,” the latter of which was sung and written by Hause’s brother, Tim, who also serves as the lead guitar player in the band. The songs were right in Hause’s wheelhouse (wheelhause? ); constructed of four chords and emblazoned by anthemic choruses, Hause’s new stuff was highly conducive to the it-hits-you factor, the experience a listener has when a song is so instantly catchy that it’s stuck in your head by the first chorus. Of course, Hause and company also played the songs his longtime fans are familiar with, including Devour’s “Autism Vaccine Blues,” Resolutions’s “C’mon Kid” and Bury Me’s “With You.” In fact, Hause’s and the Mermaid’s rendition of “With You” featured special guest Reuben Frank, Eagles beat reporter for NBC Sports Philadelphia. Over the past few years of touring, Hause and The Mermaid have earned themselves a reputation for playing tight rock shows that are short, sweet, to the point and free of any technical mistakes. Despite punk rock’s inherent simplicity, they deserve credit for that. Oftentimes, younger punk outfits find that sloppiness can add to the music’s debauchery, and sometimes that’s true. But seeing older bands who’ve had the experience to hone in their craft can be a treat, too. Throughout the night, Hause and the Mermaid consistently made the sub-par acoustics of Boot and Saddle sound half-decent. They’ll showcase that talent across the eastern side of the United States before jetting off to Europe in late April for the overseas leg of the tour, which lasts until mid-May. If you missed both Hause’s Philly shows, he’ll be near the Philadelphia region again in late September for the band’s appearance at the Sea Here Now Festival in Asbury Park, New Jersey.